Game/Thrones: Chapter Pack - Calling/Banners Rev. Quantity: 2 available Want more than 2? 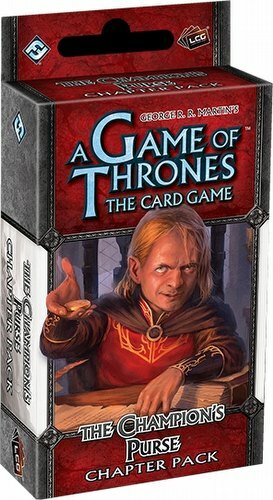 Continuing the Conquest and Defiance Cycle for A Game of Thrones: The Card Game, The Champions Purse Chapter Pack offers players new themes and strategies to explore. It is the second pack in the Conquest and Defiance Cycle set. As the Great Houses of Westeros clash over the Iron Throne, players must continually evaluate whether the reward of bringing powerful new cards into play is worth the risk of losing those cards to the enemy. Whatever House you lead, you'll find iconic characters, like Viserys Targaryen, Wex Pyke, Vargo Hoat, and Ser Edmure. Each pack contains 60 cards (3 each of 20 different cards).